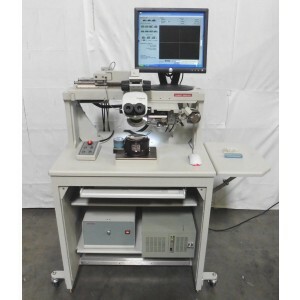 This West-Bond 35363730F-90 High Frequency Convertible Automatic Wire Bonder looks to be in good cosmetic condition. It has recently been refurbished, and is being sold in good working condition. Service and Warranty available for an additional charge. Please contact us for details. It currently has the Ball Bond Head installed (using the same clamps as the 90° Feed Deep Access Wedge Bond Head), but also includes the 45° Feed Wedge Bond Clamps, so it is Three-Way Convertible. We recommend having this machine crated for shipment, the cost of which will be the responsibility of the buyer. Approximate overall unpacked dimensions: 30"L x 43"W x 53"H.